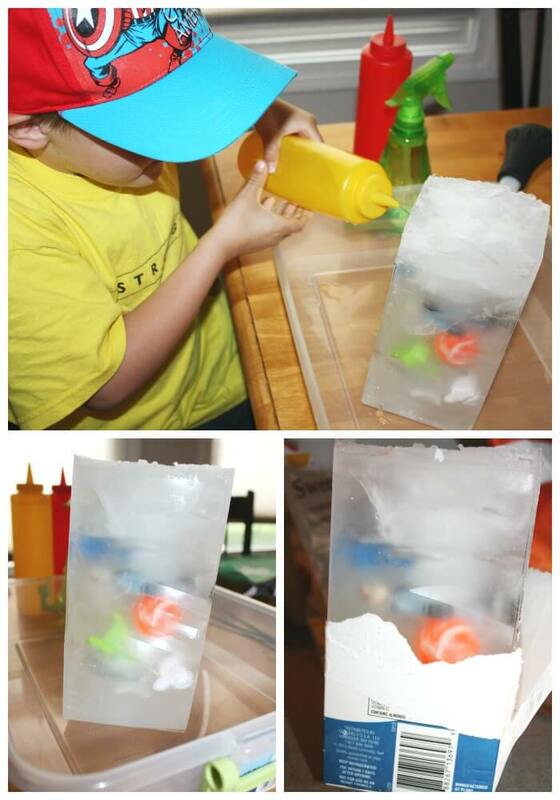 Ice is such a fun activity for young kids. We love doing all sorts of ice melts with different items. 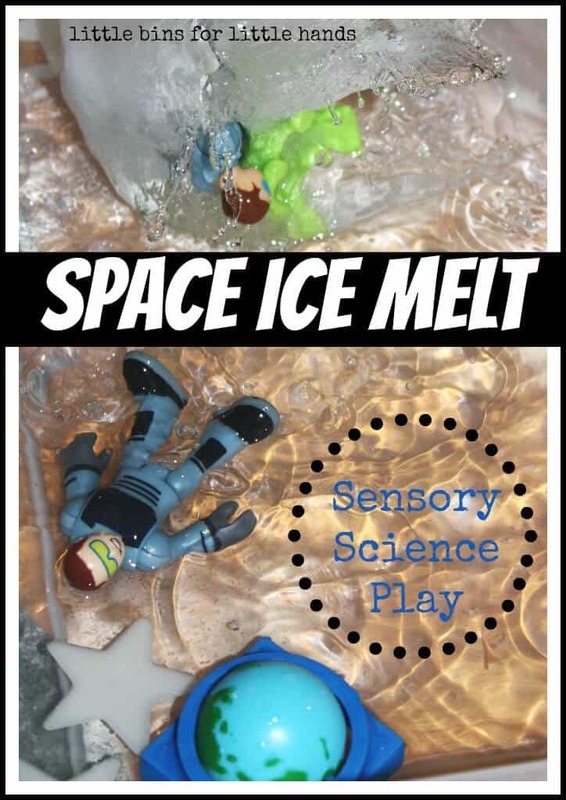 Check out our whole collection of icy science and sensory ideas. Our latest frozen car rescue was a real treat. 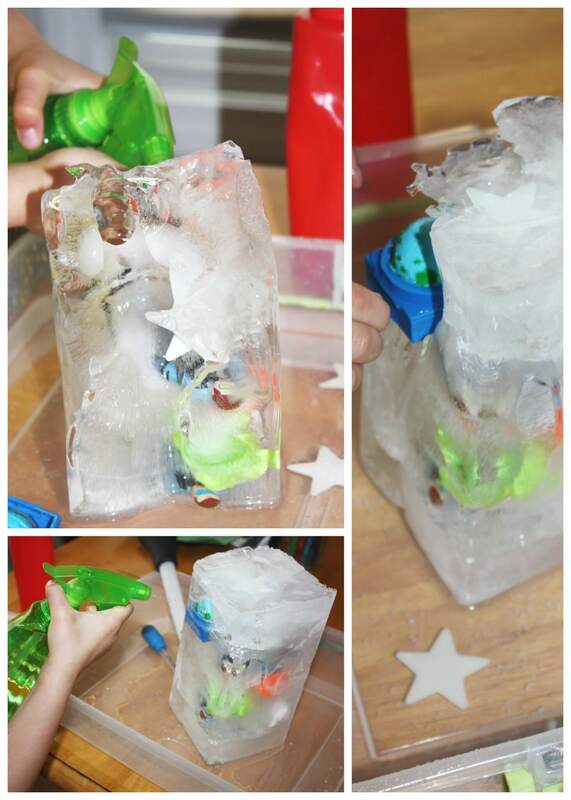 This space ice melt science is easy to create from items you may already have. The possibilities for what to freeze in ice are endless. Check out our frozen hands too. 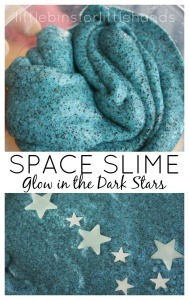 It’s easier than you might think to make this space ice melt! I used a milk carton and cut off the top so I was left with a rectangular box with an open end. I picked out a bunch of themed items to freeze in levels. You will need to think ahead and leave time for freezing the different items so that they are all the way through the ice block. For this block, I have Imaginext space men, space helmets, green aliens, plastic stars, bouncy ball planet, and the Earth top from a TOOB container! I started with some stars on the bottom covered with a couple inches of water. Once that was frozen I placed 1-3 items in each layer, completely freezing between each. I made sure to put the space men in the middle, so he would have to really work to get them out. I finished the space ice melt with more stars on the top! Once it is frozen, I cut or rip the milk carton away. Place in shallow pan and provide lots of warm water. We used squeeze bottles, a squirt bottle, and a turkey baster! 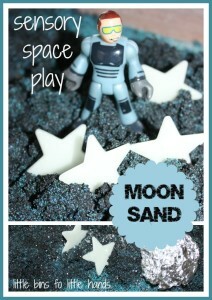 This space ice melt lasted us nearly 45 mins of play, experimentation and exploration! He was excited to unfreeze the items with the warm water! We needed lots of water. He was really interested in how he could concentrate on one small spot and make a hole through the ice if he was careful and patient with his aim. 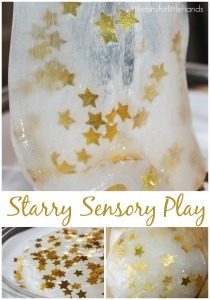 Such a simple learning activity with room for sensory play! Tactile and visual science experiments are a favorite here! He loves to see the changes taking place and is really interested in how the different temperatures of the ice and water felt on his hands. It actually takes quite awhile to melt through this space ice melt. 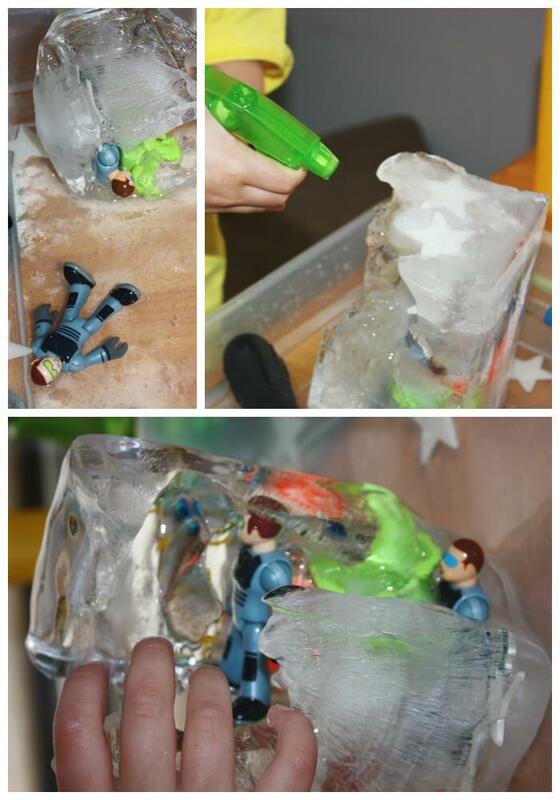 By freezing the space ice melt in different layers, there are items all the way through to unfreeze! Squirt bottles, squeeze bottle and turkey basters are also awesome for fine motor skill practice. Simple science around the house is perfect for preschool age children, especially if you can turn it into fun sensory play. I bet older kids would enjoy this too and could easily make predictions, observations and journal entries to go along with it! 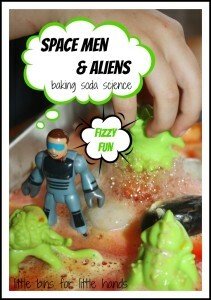 More Science And Space Fun Around The House! 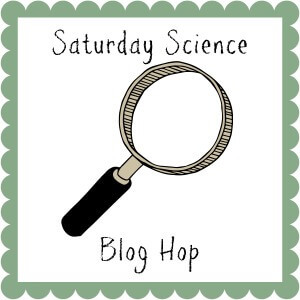 Time for Saturday Science Blog Hop Link Up! Ice melt experiments are always fun – especially in the warmer weather!